The King Kruiser IV is a large spaceship owned by King K. Rool, the latest in a long line aircraft built by him and the Kremling Krew. 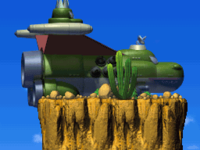 Like King K. Rool's previous vehicles, the King Kruiser IV resembles a crocodile, and is heavily armed and adorned with a large engine, satellite and red fins. In DK: Jungle Climber, after his second-last Kritter henchman is defeated in Chill 'n' Char Island and another Crystal Banana is taken from him, King K. Rool will flee from Xananab, Donkey, Diddy and Cranky Kong in the King Kruiser IV, though not before taunting them and revealing his plan to conquer Planet Plantaen and the universe. Chasing King K. Rool and the King Kruiser IV to High-High Island, Donkey, Diddy, Cranky and Xananab will just miss it as it passes the very top of the island; as the King Kruiser IV begins to leave the planet, Donkey Kong will need to chase it into the atmosphere using a Booster Barrel. 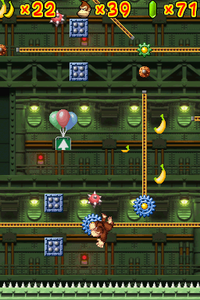 Avoiding explosive mines filling the sky, Donkey Kong will reach the King Kruiser IV and enter it through an opened portion of it, guarded by Kritters. The interior of the King Kruiser IV is similar to the many factory-themed levels of DK: Jungle Climber, being filled with such obstacles as flying mines, buzzsaws and spikes, along with an abundance of Kritter guards. After traveling through the King Kruiser IV, Donkey, Diddy, Cranky and Xananab will find King K. Rool and a Kritter. As King K. Rool flees the scene, his Kritter associate will, after powering himself up using a Crystal Banana, activate the Mega AMP and use it to attack Donkey Kong. After the Mega AMP is destroyed, Donkey, Diddy, Cranky and Xananab will find King K. Rool, who, shocked that they managed to eliminate the Mega AMP, will abandon the King Kruiser IV using a Spirowarp, with Donkey, Diddy, Cranky and Xananab chasing him. This page was last edited on April 22, 2019, at 20:01.